I have been using a lot of this Colour Variation Floss in the last couple of weeks, including some in my new 'Abel, the Stitch Explorer' pattern. I actually used a ridiculous number of different colours in that pattern as you will find out if you decide to purchase it. (Still working out the details but I'm aiming at launching it next week!) Some of these variation threads have more than one colour in a skein, other skeins have different tones of one colour. The colours are very soft and the changes in colour (or tone) very subtle. Anyway these Colour Varation Flosses, or any other variegated floss for that matter, obviously are best used in a bit of your embroidery (or cross stitch) where the change of colours can be seen. Having said that, I also sometimes use small bits of variegated floss for a detail just because it's the right colour! (or so I think). I think (cross)stitching lettering with variegated floss could give lovely results too. Where do you use variegated threads for? "Books&Stitches" is available from the 17th of April. lol, well you won't be disappointed with the second issue of &Stitches, it has my bear but many other lovely patterns as well! I once used variegated thread on a vintage pattern of a striped cat, so that the kitty ended up looking like an orange tabby. It worked out so well, I'll definitely want to do something like that again. So looking forward to the new &Stitches. 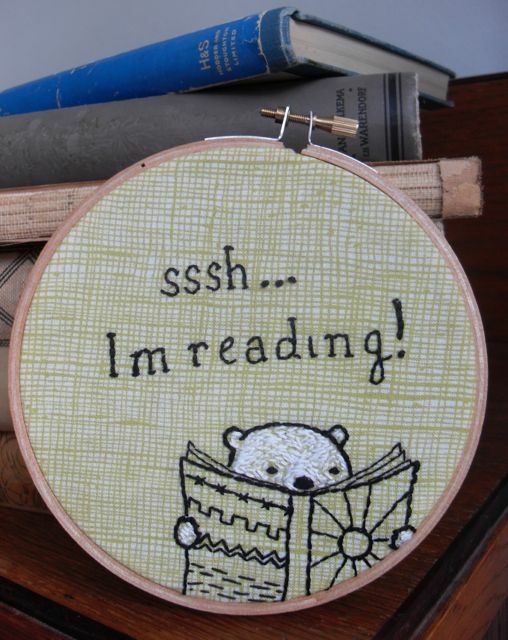 I love your little reading bear! I'd love to put him on a Kindle cover. I've used variagated thread when doing lots of French knots.